Before my USA friends roll over dying with laughter let me get a few points out. 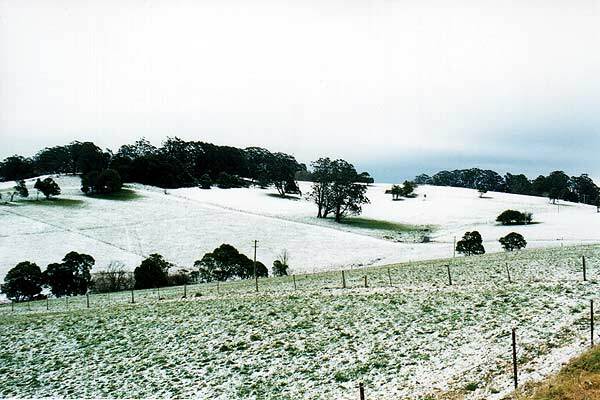 Firstly snow in Australia outside the mountain regions in the SE and Tasmania is a rare event. For example, it has not snowed in my home town in the past 150 years at least. Although I have seen snow on several occasions I have only ever seen snow flakes falling on one occasion, even on this chase I missed out on the falling snow. Therefore snow is something worth chasing to me and other Australia chasers. Now to the chase. The evening of the 9th July was very cold with a strong west wind. The wind had been expected to back around more to the south west, but this had not occurred. There was some very cool air in the upper atmosphere, but conditions were lacking surface moisture and snow had been confined to the traditional snowy mountains. Proof of the dry air was that the city of Orange barely reached above freezing, yet stayed snow free. ( Orange is one of only two cities in Australia that generally see a snowfall each year, the other is Ballarat ). I had been watching the Bureau radar on several occasions during the afternoon, an interesting band of cumulus had formed just off the coast near Moruya Heads, about 150 kilonetres south, I could see the cumulus plainly from here. During the afternoon this band had moved in a NE direction and further out into the Tasman Sea, it looked like a clearing pattern to me. There was some cloud from the west, but this by sunset had cleared. I must admit that I had forecast a fine cold and windy day for the 10th. Imagine my surprise when I awoke at 7am to find that it was raining. The wind had backed right around to the SW and cloud had developed close to the coast. Raining and only 8C ( 46F ) is rare here on the coast, usually temperatures this low are only achieved during clear still nights. I knew that a snow chase up onto the Illawarra escarpment was likely to be a winner. Firstly however I had to drop my wife at work. 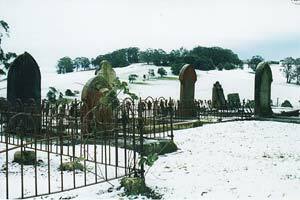 On the way I heard on the radio that Macquarie Pass and Jamberoo Pass had both been blocked to traffic due to snow at Robertson ( you have to remember most Australian's have never experienced the joys of driving on ice and snow ). This left me gambling on a 60 min detour via Mt Keira pass, then to the Hume Hwy near Picton, then onto Moss Vale, then hopefully via the Illawarra Hwy back to Robertson. At the top of Mt Keira Pass at approx 400m ( 1300 ft ) there were some small flecks of ice in the rain. The next section of road however took me to lower elevations and pure rain quickly took over again. Near the town of Picton I joined the Hume Hwy and started to climb again. Near the town of Berrima sleety rain was falling. I left the Hume Hwy and headed to Moss Vale to join the Illawarra Hwy. I was very surprised that it appeared no snow had fallen in this area at approx 650m ( 2000ft ). In fact the weather was clearing rapidly from the SW. Back on the Illawarra Hwy I headed east to Robertson. 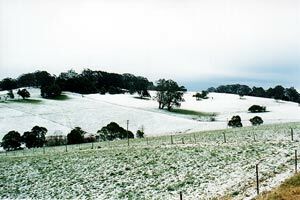 I finally got my first glimpses of snow near the Nowra turn off. It was here unfortunately that I came upon another road block, rather than answer embarrassing questions I simply took the Nowra turnoff. I later learnt that they were letting 4WD vehicles through anyway, which I own. 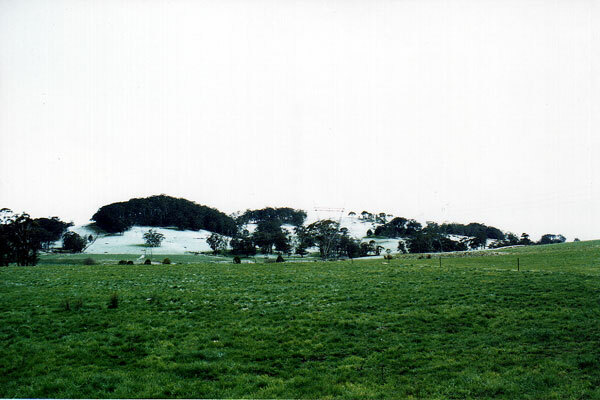 The Nowra road skirted the snow area. As you can see in the adjacent photo. The snowline was very sharply marked at approx 750 -800m ( 2500ft ). I proceeded along the Nowra road until Fitzroy Dam, from here I took a back road into the town of Robertson. It was 11am by now and the snow was starting to melt rapidly. I had missed ( yet again ) the actual falling of the snow. But I did get a few more photos in, including one in the 'dead centre' of town ( poor attempt at humour ). In the town itself there was patches of snow covering the road, therefore I can understand the road authorities actions. The snow persisted for about 5 kilometres eastwards from Robertson almost to the top of Macquarie Pass. Although it was the heaviest fall in 3-4 years it was not the largest or lowest by any stretch. I have seen snow another 200m ( 650ft ) lower then this at Macquarie Pass. At the base of the pass the road authority was still turning back sight see traffic. This I believe was a bit heavy handed as there was at least 3-4 kilometres of road from the top of the pass that was dry and snow free, yet allowed access to snow in the fields. A block could have been set up further along, this would have allowed the disappointed children to see the snow. Over thirty years ago this was how I saw my first snow, my dad driving a car load of us kids up the pass. Click here to see map of snow area.